The new Georgian government, led by Bidzina Ivanishvili, is ready to propose a plan of settlement with Russia, says Minister for Reintegration Paata Zakareishvili. Kommersant FM observer Konstantin Eggert believes the settlement could amount to Tbilisi’s capitulation. The people in the new Georgian cabinet are an odd lot. On the one hand, they declare that the country will remain committed to its strategy of rapprochement with NATO and that the European Union and will never recognize the independence of Abkhazia and South Ossetia. At the same time, they are convinced that they will be able to normalize diplomatic relations with Moscow. Paata Zakareishvili, Georgia’s Minister of Reintegration, has been speaking about re-opening the rail link with Russia, via Abkhazia. Since Abkhazia is actually a Russian protectorate, this is only possible if Abkhazians renounce their formal sovereignty – and this is unrealistic. Failing this, Georgians would then have to withdraw their claim to the breakaway territory, and submit to having their passports inspected by Abkhaz (actually Russian) border guards en route to Sochi. This is highly unlikely as well – for now, that is. 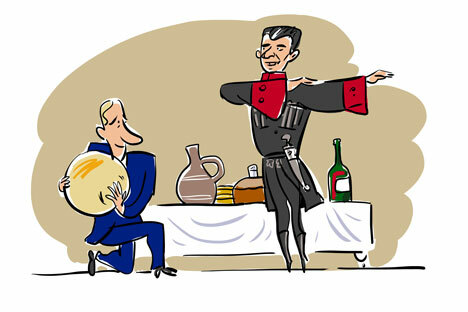 It looks as though Prime Minister Ivanishvili first wants to present Vladimir Putin with Mikhail Saakashvili’s head – in a metaphorical sense, of course. In exchange, he hopes to get something from Moscow. The Georgian president can be removed either through an impeachment procedure or by waiting until his term runs out next year. The parliamentary commission to investigate what is almost officially referred to as “the crimes of the Saakashvili regime” is about to start its work. The Kremlin has held all the trump cards since the war in 2008, and Saakashvili knew this. This is why his response was to avoid playing cards with the Russian leaders. There have been talks in Geneva, but everyone knew from the outset that this was just a politically correct fiction. Ivanishvili and his team could exchange the fate of Saakashvili for the resumption of Kindzmarauli wine and Borzhomi mineral water imports into Russia. However, Ivanishvili would then be presented with a demand to officially give up plans to join NATO. He might even be forced to recognize the de facto, if not the de jure, status of both Abkhazia and South Ossetia. After all, Greece, which does not officially recognize Kosovo’s independence, has a full-fledged ambassador in Pristina; only he is not officially called an ambassador. This could arguably split Georgian society – it is possible. Then again, Moscow has never been worried about instability in Georgia. In fact, it makes it easier to control the situation. In short, the Kremlin is several steps away from a real victory over Georgia.